Well, it makes no sense to say that actors are putting revenge on their agenda while accepting film roles, but there are few cases that are better suited to describe in this way. Ramyakrishnan won the role of Sivagami in the hit series Baahubali. It replaced Sridevi, a popular choice of manufacturers. It is said that Ramyakrishnan is the first choice of Maruthi Dasari for Shailaja Reddy Alludu of Naga Chaitanya. The film will start shooting from next February, Naga Chaitanya ends the important parts of Savyasachi. Harika and Hassine Creations will produce the film with the combination. 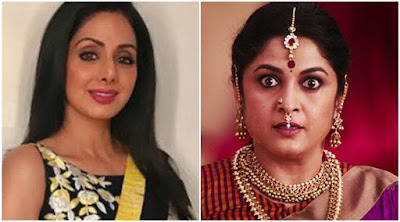 A little bird told us that the creators are looking to turn to Sridevi instead of Ramyakrishnan for the role of "Attha". While many thought that Ramyakrishnan was an ideal choice, director Maruthi thought that Sridevi would make the film much more meaningful and would also be useful for publishing it in other languages. As the team wants her to accept their proposal, they asked Nagarjuna to try to get her consent for the film. Let's see if Sridevi will become Shailaja Reddy to return to Sivagami.